- US Airways has unilaterally altered the parties' collective bargaining agreements by intentionally frustrating and abrogating the contractual grievance and arbitration procedures outlined in the collective bargaining agreements. - US Airways has deliberately delayed the scheduling of disputes as required under the Railway Labor Act. It has failed to prosecute disciplinary and contractual grievances in a timely fashion and refused to complete arbitration hearings within the allotted, agreed upon time. Its actions have created a backlog of more than 500 unresolved grievances. Lastly, US Airways has refused to follow well-established and agreed upon procedures and practices regarding the settlement of disciplinary and contractual disputes. - US Airways has violated its obligations under the RLA to maintain the status quo with respect to terms and conditions of employment for those US Airways employees represented by USAPA. - US Airways has also violated the RLA by intentionally failing to "exert every reasonable effort" to reach a settlement with USAPA regarding an integrated collective bargaining agreement. USAPA believes the defendant has bargained in bad faith in violation of the RLA by engaging in surface bargaining and employing evasive and dilatory tactics with respect to the ongoing major dispute. - US Airways has demonstrated a clear intention not to reach an agreement with USAPA regarding an integrated collective bargaining agreement, and therefore has violated the Railway Labor Act. - US Airways has committed an additional violation of the Railway Labor Act by failing to "exert every reasonable effort ? to settle all disputes ? arising out of the application of" the current collective bargaining agreements. 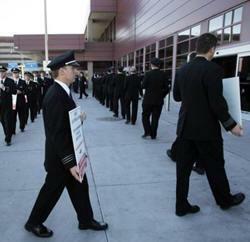 - US Airways has failed to make "every reasonable effort" to settle or otherwise resolve contractual interpretation disputes in violation of the Railway Labor Act. USAPA feels that the egregious nature of these illegal acts has been compounded by important safety grievances that remain unresolved as a result of US Airways' actions. In a statement to the US Airways pilots, USAPA President Mike Cleary said, "Each of us is painfully aware that remaining mired in bankruptcy-era contracts after six years has created a level of hardship for our families that is unsustainable. "The honesty, moral character and integrity that we have applied to our obligations during negotiations have been met with exactly the opposite from management. They have used every opportunity to stall, delay and attempt to exhaust the resources of our union and our pilot group. It is time for it to stop. We look to the legal system to provide relief and get our negotiations back on the level playing field that the statute requires." In its complaint, USAPA seeks to enjoin US Airways from unilaterally abrogating and altering the relevant collective bargaining agreements pending completion of the RLA's major dispute resolution procedure. USAPA requested that the District Court issue a preliminary injunction prohibiting US Airways from engaging in this misconduct. In his letter to the pilots, President Cleary went on to state, "I have no doubt that Management will respond in a punitive fashion to this demand for statutory compliance by taking hostages with the discipline mechanisms that are at their disposal. I can promise you that when they do, your union will respond swiftly and aggressively to defend and protect your jobs and your rights."